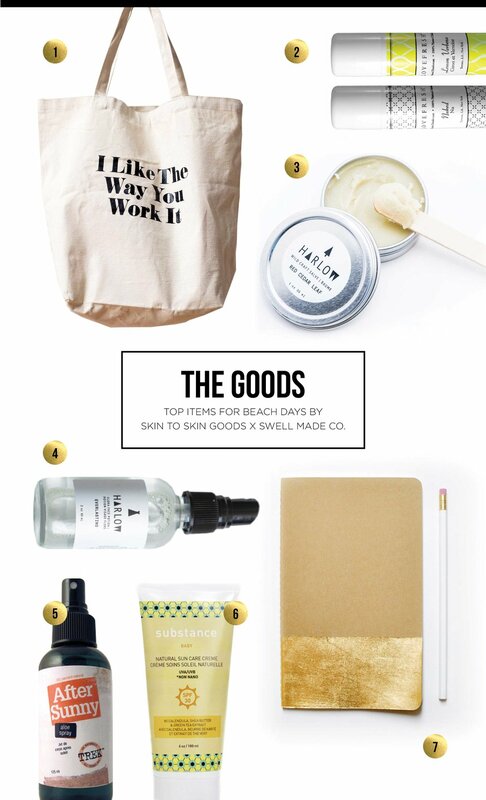 LOVE IT - Top items for beach days by Skin to Skin Goods and Swell Made Co.
We've joined up with friends for a fun, summer guest blog post from Tina of Skin to Skin Goods - An online shop featuring naturally sourced, locally made, carefully selected skincare. All made right here in Canada. She's lined up her favourite skincare goods for a smooth day at the beach, including a few things from Swell Made Co. Getting ready for days in the sun and sand can be a bit daunting after months of being indoors, but Tina has made it a breeze with all The Goods shown here. Enjoy your beach days! Harlow + Lovefresh are beach ready with a Turkish towel. Photo by Skin to Skin Goods. When you head to the beach, you'll want to pack everything in a roomy, sturdy and stylish tote bag. The 'Work It' cotton tote bag is the perfect statement for beach days and summer adventures. This handy, light and conveniently sized deodorant stick is a must have. You can touch up anywhere, even the beach. It is made with the same effective formula the regular sized stick is and available in an unscented (naked), lavender and lemon scent. Scrapes, cuts and scratches are usually a part of any good outing, even the beach. This all-purpose healing balm is great for almost anything. From dry lips to a scraped knee this balm is meant to rehydrate and repair. A little goes a long way. A great way to refresh and cool off from the sun with the added bonus of hydrating your face. A multi-purpose facial spray that tones, hydrates and refreshes your complexion. Available in 3 blends each with unique scents and properties. The sun can have its drying effects quickly, especially when your kids lose track of time on the beach. A quick and super easy way to keep your skin happy is by spraying this aloe mist. Aloe is well known for its healing, soothing properties especially for burns and dryness. For an added cooling effect, keep it in your fridge/cooler. This is a chemical-free sunscreen that protects your skin from the sun by creating a natural, physical barrier. It is non-greasy and water resistant, making it very effective. This suncare crème is meant to moisturize, protect and soothe your skin, as it is made with nourishing oils. The botanical blends of grapeseed and tea tree extract help cool and soothe over-exposed skin. A favourite for babies, toddlers and adults. Also available in an 18g stick for easy face application. Sometimes you just need a moment of relaxation (on the beach) for ideas to arrive. Don't miss the chance to capture them with a JOT JOT Journal. A kraft paper Moleskine journal that has been gold foiled by hand. The next best thing to bring, is your favourite book for a bit of down time. For fun, we thought we'd share our favourite beaches in Canada to kick off the season. What are your favourite beaches? Comment below and let us know. Watch for our next post on hiking adventures too. "Any beach where my kids are happy throwing rocks works for me. It's a family pastime most of the year. My favourite beaches can be found locally in Toronto's east end. You'll often find us at Ashbridges Bay and Cherry Beach where you'll find peace and quiet, and beach glass galore." "Canada has so many great beaches with it's coastlines and lakes. I live right by Toronto's urban beaches, and I love to visit Sandbanks Provincial Park just 2 hours away (both on Lake Ontario). But, for a truly magical day, take me to Lawrencetown Beach in Nova Scotia or Brackley Beach on Prince Edward Island." Skin to Skin Goods x Swell Made Co.